Hahahahah South Park spoofed the Galactic Federation. Since I don’t watch TV I missed the whole thing and had to come by it on the intertubes. 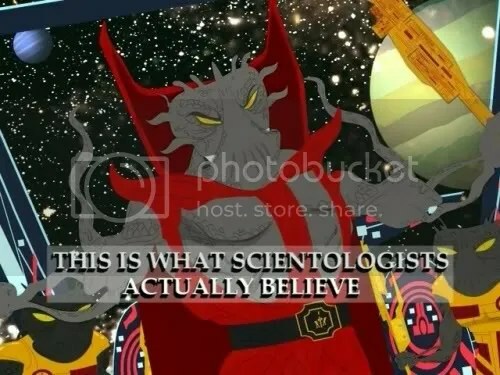 Since we are now being “socialized” by the main stream media to believe in aliens, ancient, modern or otherwise, you might as well know that according to the radical linguistics folks at Half Past Human (AKA the web bot project), the whole Galactic-Federation-Ascension-Mythos can be traced linguistically to the Scientology cult. Scientology has repackaged itself repeatedly to make itself more credible to the, well, credulous. Other New Age religions spin similar stories, socializing adherents to believe and behave as “galactic citizens,” instead of identifying with the supposedly outdated notions of Nation or State. I think the whole “space aliens will save us” meme, including Scientology and its New Age copycats, is a psychological operations project jinned up by our . . . Hmmmm what should I call them . . . let’s call them our “underground government” in both the literal and metaphorical sense. It is a spinoff society that’s had secret “Star Wars” technology for generations, along with all sorts of life-saving and genetically-enhancing technologies that they’ve not (yet) shared with the rest of us. The Undergrounders operate above and beyond the laws the rest of us are expected to follow. I imagine they must lead interesting lives, whether underground or in space, but sheesh! They get little to no sun! Members of this underground society, known only to the world’s self-annointed Overclass and a few of us tinfoil-hatted “watchers,” have engaged in technology insertion since, well, forever. They keep their toys to themselves for 25 or 30 years or until they’re replaced by better/faster/more-deadly toys, whichever comes first. The undergrounders have a problem this time, however: The new technologies have to do with new/cheap/easy energy sources that will give ordinary people all over the world a lot, and I mean a LOT of autonomy and power. 1. Our new reality, presuming we get on with it already, is going to be so mind-blowing most of us won’t even believe it. 2. It will require a complete overhaul in the way we understand and experience reality, including our ideas about space, time, and matter. 3. When the people of the world learn that the Undergrounders have been hoarding the information, we’re going to be PISSED. You mean we didn’t have to pay electric and gas bills all those years? UM, yeah, sorry, bummer eh. 4. Once the genie is out of the bottle then entire Control Grid is going to be obsolete and humanity, for the first time ever perhaps, will (literally) control its own destiny, without needing to follow strictures (legal, religious, economic, etc.) imposed upon us by an Overclass (kings, clergy, bankers, etc.). 3. “How can we insert this technology without losing control? Enter the “aliens will save us” meme. Genetically superior so-called “space aliens” are to become the next Benevolent Overclass, and the New Physics is to become the next religion. Never mind that it’s all BS: These are ordinary human beings whose parents and grandparents left the rest of us behind long ago. Now they’re trying to integrate, and the “We’ll save you from your global disasters!” cover story was the best they could come up with. I know: It’s pretty stupid. However they really do feel alienated, and they really do belong to no country, so they really do meet the technical definition of “alien.” It’s not their fault: They didn’t ask their parents to put them in this bind! There’s nothing we can do about this freakshow besides call BS, which won’t make any difference anyway, so how about joining in the fun instead? It’s cheap and easy: Just watch things unfold! Keep an eye out for TV shows and movies that normalize the concept of aliens that look just like us, only better, smarter, and longer lived, walking among us. It’s all coming to a head at warp speed, because there seems to be a deadline of sorts. Pinky reads the woo so you don’t have to, so I’ll keep you posted on any developments, especially if they’re funny! Stay tuned.